Only humans define flowers from weeds; the saying goes. Or at least something like that. I believe the point of it is that we shouldn't judge by outside appearances. But that's kind of one sided if you ask me. 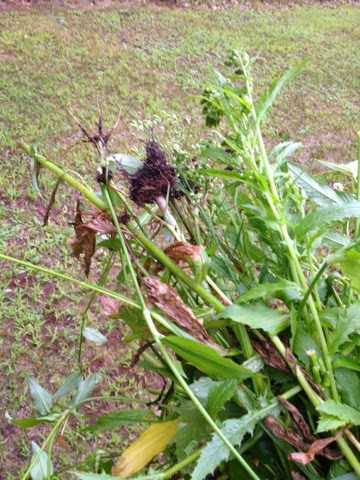 Besides not looking nice or being useful, weeds steal space, food, and water from nice looking or useful plants. In a flowerbed or garden, where one has limited space to grow plants, they want the plants they planted to thrive. Not the freeloaders who move in due to try better soil and extra water. Gardeners want to get the most out of their efforts, their investments of time, money and resources. For me the definitions can be both clear cut and confusing. It's clear cut for my garden. I want the peas, beans, corn, potatoes, etc. that I bought, planted and watered to grow, not whatever else shows up. Far as flower gardens go, I'm at a loss. I don't have a flower garden, but I have stuff growing in front of my house that previous owners planted and it still comes up. Some looks nice to me and some doesn't. So I pull out what I don't like. Am I promoting weeds or flowers? Are they all flowers and I'm being picky, or am I clueless and their all weeds. I have no idea. I also wouldn't be bothered if nothing come up next year to be honest. I started this post with the intention to say how I go about weeding in a humorous way.But as I typed this post kind of morphed into a metaphor that could be inspiration to improve your surroundings or some type of general social statement. Take it for what you want.